Our research focuses on studying signalling pathways that regulate inflammation and inflammation-associated pathologies. We have a long-standing interest in studying the biology of Tumor Necrosis Factor (TNF), a cytokine with important functions in host defence and inflammation. Anti-TNF therapies are highly effective in the treatment of inflammatory bowel disease, rheumatoid arthritis and psoriasis exemplifying the key pathogenic role of TNF in inflammatory diseases, however the mechanisms by which TNF instigates inflammation are poorly understood. TNF induces the expression of many pro-inflammatory cytokines and chemokines by activating the transcription factor NF-kB. However, TNF also induces cell death by activating caspase-8-mediated apoptosis or RIPK3-MLKL-mediated necroptosis. While early research focused on the regulation of cytokine production as a primary pro-inflammatory function of TNF, our research suggested that TNF-induced cell death is also a potent trigger of inflammation and could be implicated in the pathogenesis of inflammatory diseases (Nenci et al, Nature, 2007; Kumari et al, Immunity 2013; Kumari et al, eLife, 2014). Our current research focuses on studying the signalling pathways induced by TNF binding to its receptors and how these pathways trigger inflammation. TNFR1 signalling pathways. Upon TNF binding, TNFR1 undergoes trimerization that induces the formation of a receptor proximal complex (Complex I) through sequential recruitment of RIPK1, TRADD, TRAF2/5, cIAP1/2, and LUBAC, TAK1/TAB2/3 and NEMO/IKK1/2 complexes. Several ubiquitination and phosphorylation events take place at Complex I that promote cell survival, including the TAK1/MK2-, IKK1/2- and TBK1-dependent phosphorylation of RIPK1 (early cell death checkpoint) and the TAK1- and IKK-dependent activation of the NF-κB signaling pathway (late cell death checkpoint). 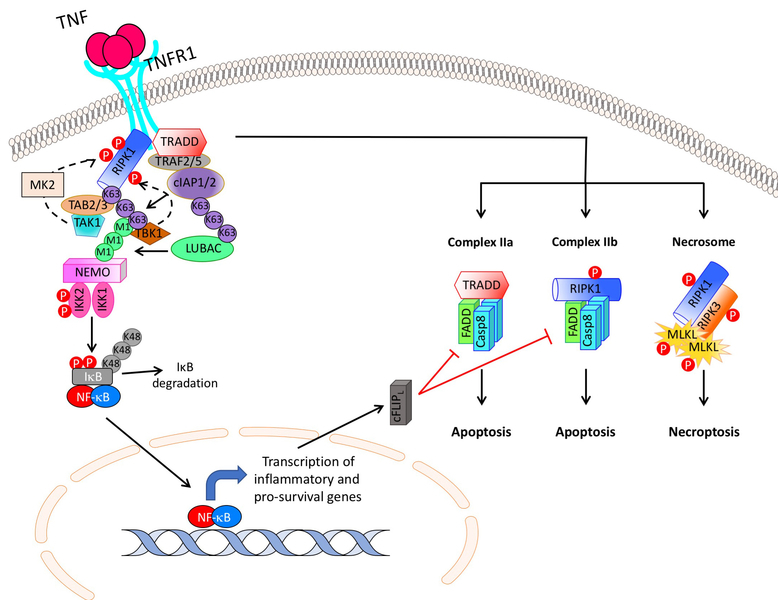 When the prosurvival mechanisms emanating from Complex I are compromised, TNFR1 can induce apoptosis by TRADD-dependent (complex IIa) or RIPK1-dependent (complex IIb) activation of FADD/caspase-8, and necroptosis through RIPK1/RIPK3/MKLK complex (necrosome). When present at high levels, the Caspase-8-like molecule cFLIP forms heterodimers with Caspase-8 preventing its full activation and inhibiting apoptosis. Necrosome formation depends on RIPK1/RIPK3 autophosphorylation, which leads to phosphorylation of MLKL followed by its translocation to the plasma membrane, where it induces cell permeabilization. In most cell types, apoptosis is the preferred cell death type that is executed, while necroptosis can be induced when Caspase 8 activity is impaired. (see also the review by Kondylis et al, Trends Mol Med 2018).